Four officers successfull y completed their 2015 annual recertification, as Her Majesty’s Customs, K-9 Unit continues to be among the top units in the region. The certified officers are Akeed Fahie, Brain Farrington, Darwin Scatliffe and Olympia Fahie. Assistant Commissioner of Enforcement, Mr. Clinton Romney said that officers and their dogs underwent advanced scent detection methods using new K-9 training methods that covered all areas of contraband interdiction. He added that officers and their dogs recertify on an annual basis to ensure all legal requirements are met and are up to date. 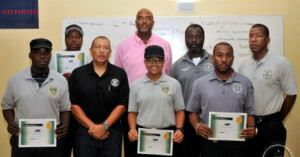 The recertification training was facilitated by K-9 on Patrol (K.O.P.S), President and CEO, Paris Nicholson III. Mr. Nicholson said training is an ongoing process and recertification is important for legal matters. He said officers and dogs must be recertified to improve credibility when presenting evidence to the court of law. Nicholson stated that officers underwent a new type of training, which allows the dog to enhance its skills and become sharper while searching for contraband. These methods, he added, educate the officers to understand the process for the dog to be more effective to perform their duties. Nicholson said the K-9 Unit acts as a deterrent to perpetrators at the various ports of entries. He said the unit serves as a public relations tool to attract interested young persons to become custom officers. The youth are attracted to the dogs which serve as a great platform to introduce them to the profession of Custom Officers. K.O.P.S. provides service dogs to law enforcement agencies throughout the Caribbean and has been providing services to BVI Customs since 2003. BVI Customs maintains one of the largest and most effective K-9 Units in the region.